Over the past several years, ASG has recorded data on the civil helicopter fleet worldwide. The following is an analysis of new deliveries, as well as pre-owned aircraft. This analysis provides insight into the market, amid an oil and gas downturn and the recent reshaping of several major international operators and leasing companies. The four major civil helicopter OEMs (Airbus Helicopters, Bell Helicopter, Leonardo and Sikorsky) manufacture a wide-range of turbine helicopters from light single-engine helicopters, such as the Bell 505, to heavy multi-engine helicopters, such as the S92. Starting from 2010, ASG has witnessed a gradual decline in new deliveries from OEMs. During that same year, the four major OEMs had a combined new delivery number of 824 helicopters. In 2018, the total new deliveries were approximately 460; about a 44% reduction from 2010. The most noticeable reduction was the decline in the medium and heavy sized multi-engine helicopter market segment. Notably, new delivery numbers for aircraft models such as the H145 (EC145), Bell 429, AW139 and S76D are declining. However, during 2016 to 2018, deliveries of later helicopters, such as the Bell 505 and H125 saw an increase, causing total delivery numbers for the single-engine light category to increase. This reflects the market’s shifting interest in the lighter helicopter segment. 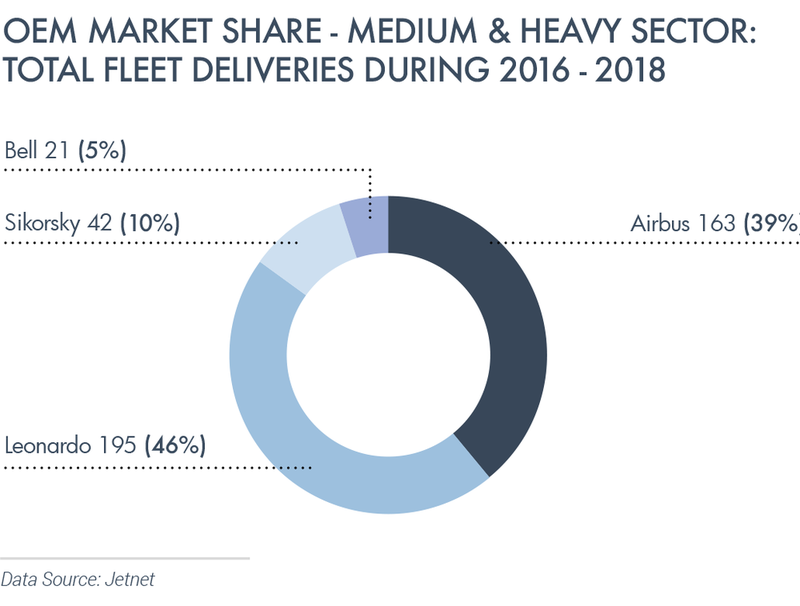 During 2016 to 2018, Airbus and Leonardo held 88% of new deliveries in the medium and heavy helicopter segments. The H145 and AW139 represent the highest number of deliveries during this time. 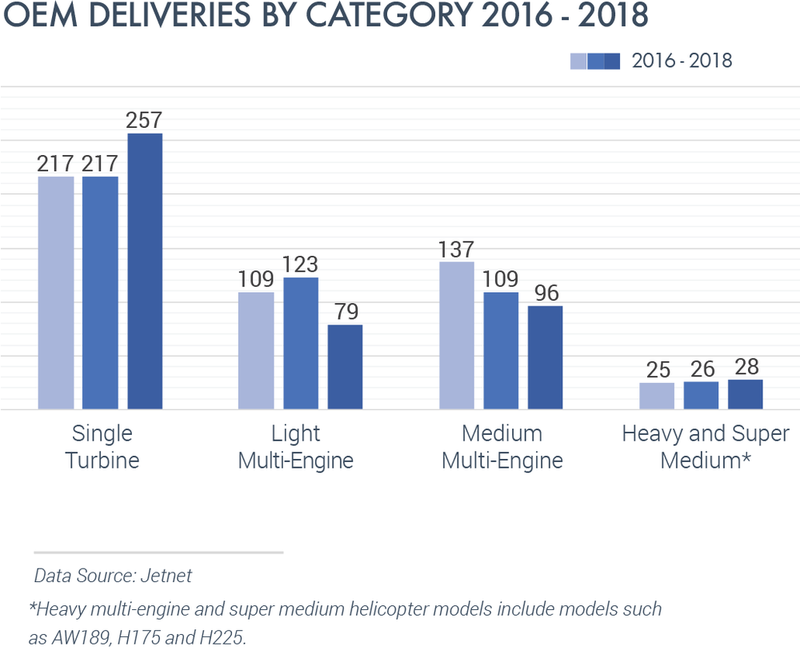 The most delivered Airbus models for the past three years were single-engine turbine helicopters, including the H125 & H145. The H125 is a successful and popular light utility helicopter. New H125 deliveries have been high, although there have been no signs of this increasing. Although deliveries for the H145 have declined, this model is still recognized for its versatility among various mission segments. For O&G models, there were no deliveries in 2018. Airbus Helicopters’ H160 will start replacing the H155 in the coming years, with expectations of an increasing market demand. In 2016, the H225 fleet was grounded after a fatal accident involving the model. This has heavily affected market confidence; the past three years saw only five H225 deliveries, including one delivered in early 2019 to a Mainland China operator used for passenger transportation / sightseeing. A large part of this market demand was filled by its lighter competitor: Leonardo AW139 & AW189, which are relatively smaller models, as well as its own H175 model, which had 23 deliveries as of yearend 2018. Bell Helicopter is the only OEM that has seen an increase in new deliveries for the past three years; due, in great part, to the light single-engine Bell 505 model, which has delivered 126 aircraft in total and notably 102 in 2018. The cost-efficient 407GXP had 120 new deliveries over the past three years. Bell acquired a larger market share from its competitor’s light helicopter market segment – such as the Airbus H125 and Robinson R66, both capable of performing light utility missions. However, Bell suffered from a decline in new deliveries with the rest of its production line. Of the medium and heavy models, there have only been 21 412EPI and EP deliveries (three 412EP and 18 412EPI) over the past three years. Bell postponed the delivery of the Bell 525 Relentless, in attempt to avoid the competition from the pre-owned market and other OEMs. Leonardo's helicopter division focuses largely on medium and super medium sized helicopters. It is the only OEM that recorded an increase of new deliveries in these categories – AW189, which is one of the first certified “super medium sized” models, aimed at missions such as O&G and search and rescue (SAR). The AW189 is mainly used by large O&G operators and government services. AW139 is a medium sized twin-engine model aimed at the multi-mission market. It offers a larger cabin compared to its main competitors the S76D, Bell 412 and H155 and its engine has more power, allowing the aircraft to have a wider mission capabilities than other comparable models. The AW169 is smaller compared to the AW139, and has been widely accepted in the EMS segment to date. There have been 20 S-92 delivered for the past three years, many of which were to government operations. However, of these deliveries, only two were delivered in 2018.